ST. GEORGE — Fire and medical crews were stretched to the limit in Mesquite, Nevada, Saturday after multiple calls scattered fire engines and ambulances across 32 square miles to tend to fires, crashes and medical calls. The first call came in just after 1 p.m. when two ambulances were sent to a distress call involving an individual that was having difficulty breathing, and about 15 minutes later, a single-vehicle crash was reported on Pioneer Boulevard involving a black Dodge pickup that crashed into a pole, Mesquite Fire Captain Spencer Lewis said. 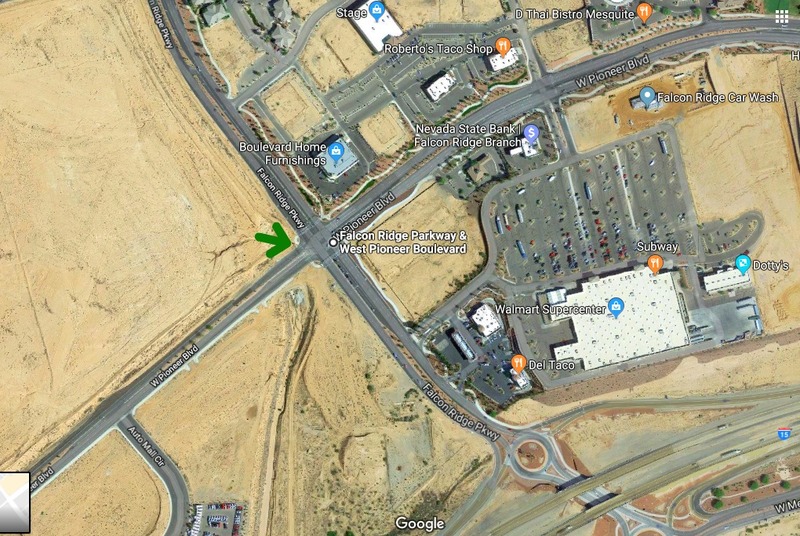 At the time of the crash, the man was heading west on Pioneer Boulevard, and just as he was making a left turn onto Falcon Crest Parkway, he “completely lost consciousness,” Lewis said, and crashed into a four-pole street sign. The truck continued forward until it came to rest against a second sign post, causing extensive damage to the driver’s side. When emergency personnel arrived, bystanders were helping the driver, who managed to get out of the truck through passenger’s side door. The driver told responders the last thing he remembered was heading into the left-hand turn. “The next thing he remembered was when people were asking him if he was OK,” Lewis said. 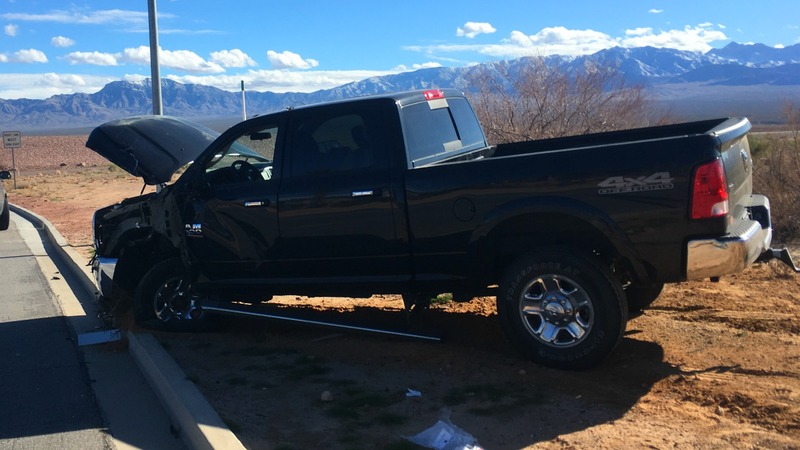 The man was transported to Mesa View Hospital in Mesquite for evaluation and treatment, while the pickup was towed from the scene. The driver was uninjured, and the vehicle was towed from the scene. While crews were still on scene cleaning up the car fire, two of the department’s ambulances were dispatched to a second distress call involving an individual who lost consciousness in the residence. Meanwhile, a second vehicle fire was reported at 4:30 p.m. involving a black pickup truck that caught fire while parked in front of a residence. Fire crews arrived to find the flames burning towards the rear of the truck where the gasoline tank was located. “That fire was pretty serious because that truck was parked in the driveway, so the fire was threatening the home,” Lewis said. Once the fire ruptured the truck’s fuel tank, the situation became intense, Lewis said, and firefighters performed an aggressive attack on the gasoline-fed blaze. After being extinguished several minutes later, crews continued suppression efforts to reduce the risk of it reigniting. 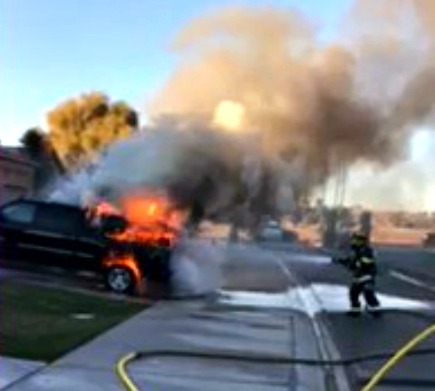 See firefighters attack the truck fire in the video below, courtesy of Mesquite Fire and Rescue. While the vehicle was a total loss, he said, the home it was parked in front of was undamaged. Saturday’s mayhem is something Mesquite Fire and Rescue is prepared for. Emergency medical staff responded to more than 2,900 calls in 2018, and the number of calls have risen steadily over the last decade, up from the 1,870 calls in 2008. The department has three fire stations, two of which are staffed full time with rotating crews, totaling 27 full-time and 15 part-time personnel. The department provides service to an area that covers approximately 32 square miles and serves over 20,000 residents, as well as providing mutual aid in neighboring Arizona and unincorporated areas of Clark County, Nevada. The department also provides 24-hour basic, intermediate and advanced life support, a critical care transport program and interfacility transports from area hospitals. This report is based on statements from emergency responders and may not contain the full scope of findings.